A great first impression is a key to selling your house or condo. Prospective buyers want to see your home in “showplace” condition. Most buyers select their home based on emotion and then justify the decision with facts, so it’s important to make the house look great. Remember, you have just a few seconds to create a winning first impression. 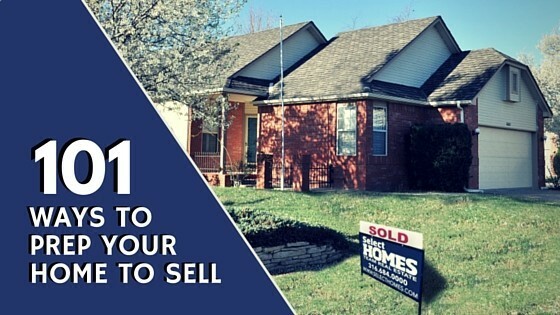 Here are 101 ways to prepare your house for sale to help boost your bottom line and sell your home quickly. Spruce up the lawn by cutting, trimming, weeding and removing all yard clutter. A great-looking lawn makes a great first impression. Weed and apply fresh mulch to flower beds — it gives a fresh and maintained look for a low cost. Power wash home’s exterior, driveway, walkway, patio and deck. Consider painting if the house needs it, or if the color is “dated” — a fresh coat of paint on the outside can make the house look completely updated. Try to stick with more neutral colors for broad appeal. Plant some bright flowers in places that could use some brightening. Clean windows inside and out – make them sparkle. Make sure your house numbers are easy to see, and consider getting new ones if it would improve the look from the street. Make sure there are no burnt our bulbs in the exterior lighting. Photo courtesy of @darkday on Flickr. The way you live in a home and the way you sell a home are two different things. It is time to emotionally disconnect. Once your home is on the market it’s in competition with other properties — it needs to always look like a model home. Even if you aren’t Mr. or Ms. Perfect, your home needs to look like you are. Here are tips on keeping the inside of your home looking its best. Replace the entrance light bulbs to brighten up the entry, and make sure the light is on if people are coming at dusk or after dark. Make sure the door is in perfect working order. No squeaking, jamming or sticking locks. Make it effortless to get in the house. Make sure all interior doors are free from squeaks as well. Once inside, make sure the entryway is free of clutter: shoes, coats, umbrellas and anything that takes up space. If you have an entry table or shelves keep them clutter free. Make the front closet look spacious and uncluttered by removing any extra coats, shoes, hats, gloves, etc. Make your entryway look as spacious as possible– that may require removing some knick-knacks. Photo courtesy of @Jon Hurd on Flickr. Go through your home room by room and pack up 30% of your stuff. You want it as clutter free as possible. Basically, declutter and depersonalize. If carpeting is in good condition and neutral in color, have it cleaned. If not, replace it. Off-white carpet is best; this makes the rooms look larger and cleaner. If replacing the carpet pad, select a very thick one then install just a modest grade of carpeting. The feel will be plush and expensive, but it’s not. Clean or refinish wood floors. Pack everything from all closets that you don’t need. You want to create the perception of roominess. 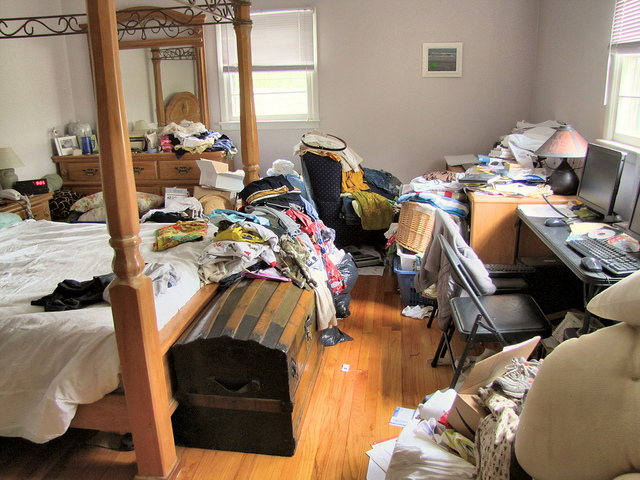 Remove everything but a week’s worth of linens from the linen closet. Fold them neatly and color-coordinate them. Remove out-of-season clothes from clothes closets. During the day, have all your curtains and blinds open. If the day is cloudy, turn on all lights as well. Make sure blinds, shades and window coverings hang level. Brighter is better. Upgrade all your light bulbs to at least 100 watts to make your house appear bigger more inviting. Clean all vents and returns. Remove any family photos you have displayed. Too much of your personality in evidence does not allow for the potential buyer to “mentally” move in. If you have pets, get rid of pet odors and get rid of evidence such as food, dishes, litter boxes, etc. “Memorable” paint jobs aren’t necessarily a good thing. Photo courtesy of @Amy West on Flickr. Make your kitchen look more spacious by removing everything from the counter like the coffeemaker, toaster, flour container, etc. Your eat-in kitchen and dining room should have a table and chairs in it to showcase the rooms’ purpose. 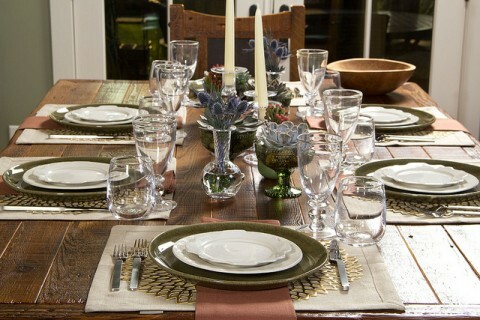 Remove extra leaves from your dining room table to make the room look larger. Set the dinner table or counter bar to help buyers envision the room. Make sure the inside of your cabinets are organized and clean. Store non-essential items elsewhere to make the cabinets look more spacious. If your cabinets show wear and tear, you might want to paint them. A simple trick to update the look of your cabinet doors is to replace your current knobs with new ones. Remove notes, pictures and coupons from the refrigerator door. Keep garbage and recycling bins out of sight. Keep the exotic spices and fish to a minimum when cooking the night before a showing. Work towards achieving a “clean” smell. Get rid of kitchen odors by pouring hot salt water down the drain twice a week. Also, grind some lemon rind in the disposal. Setting your dining room table can help buyers envision life in your home. Photo courtesy of @Didriks on Flickr. 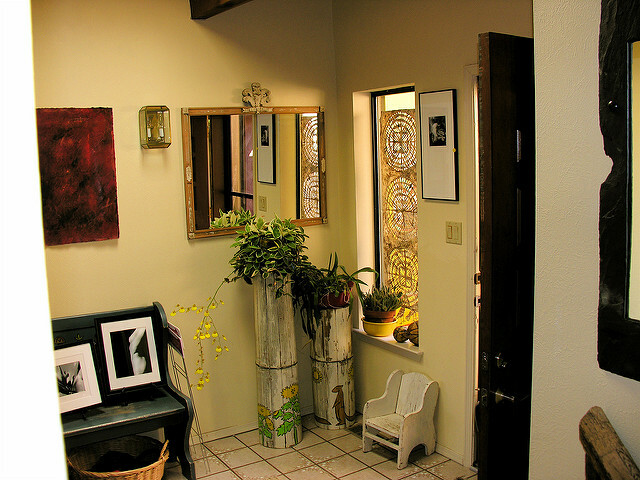 Take down personal photographs and family items that create the sense that this is your home. You don’t want the buyer wondering, “Who lives here?” You want the buyer to see themselves living there. If you have a favorite “old” chair that doesn’t go with the rest of the furniture, remove it. Big furniture can weigh down a space. During “showings” turn on all lights and lamps. If your furniture shows the effect of raising kids or if pets have ruined the rugs and upholstery, think about storing or removing your existing furniture. Buy, borrow or rent what you need. Limit all personal items on display. Again, depersonalize. One way to depersonalize your living room? 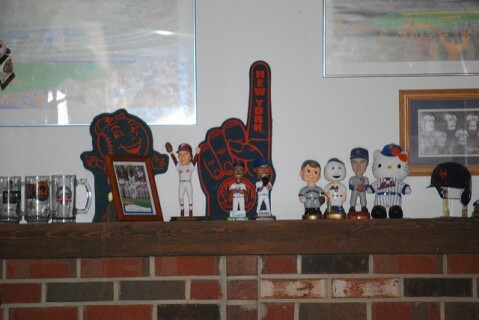 Remove sports team memorabilia. Photo courtesy of @slgckgc on Flickr. Put the trash can under the vanity to clear floor space to make the bathroom appear as big as possible. Always empty bathroom trash cans before showings. New silicone beading can do wonders for your shower, tub and sink area…especially if the caulking is stained or cracking. Keep your shower and tub spotless. Buyers will often look behind the curtain. Keep shampoos and soaps to a minimum. 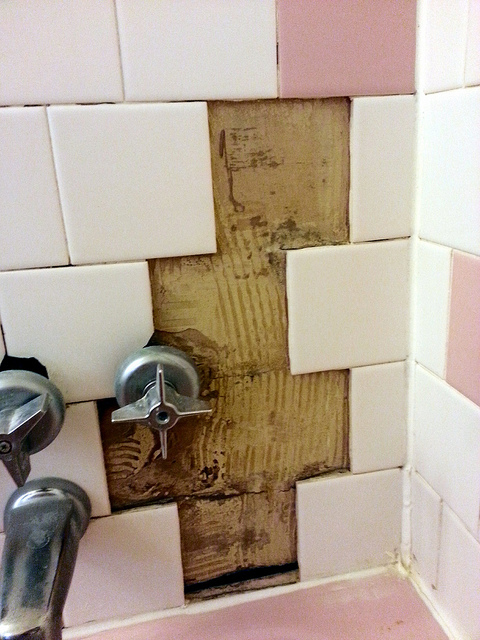 Scrub tiles and bleach – or replace – the grout so it all sparkles. Some eyesores are also easy to fix. Photo courtesy of @phil_g at Flickr. Remember that buyers love to snoop and are likely to look in your closets. Make sure the closets are as spacious looking as they can be. Remove all the clothes, shoes, and items that you won’t be using right away. Make your bed look pretty and make sure the bedspread or quilt fits the bed properly and hangs low enough to cover the view under the bed. Buyers won’t look under the bed, so you can store other non-essential items there. Hang your clothes by category: all blouses together, all shirts together, buttoned and facing the same direction. Items that you don’t need should be taken out of the closet to make them more spacious. If you need to, get a storage space for them. Coordinate your clothing in your closets and line shoes up neatly so it looks as organized as possible. If the potential buyer sees that you take great care of your personal items, they will naturally assume you give the same attention to caring for your home. Now’s a good time to pick up your room. Photo courtesy of @lisaclarke on Flickr. 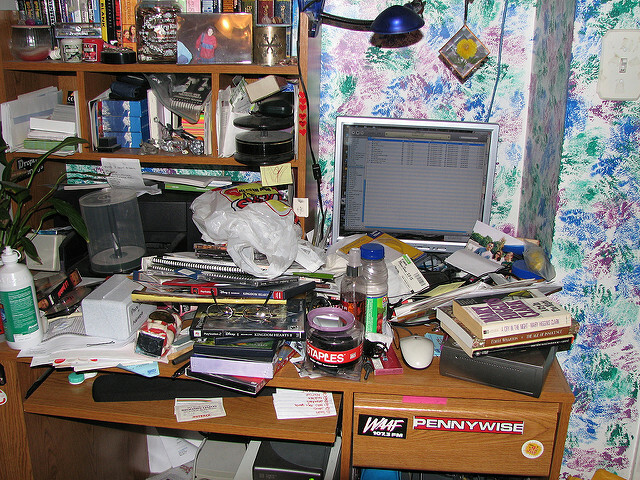 Clean everything off the desk surface, leaving only your computer and desk lamp. A neat desktop makes the work space look more functional. Make your home office look easy to take care of. Photo courtesy of @alismith44 on Flickr. Tidy up and organize your basement. Discard, donate or recycle items you can give away. 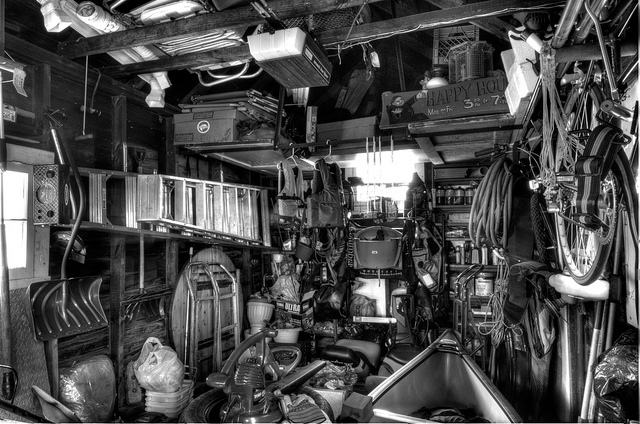 The garage is usually the catch-all area where everything goes that has no other place to go, so it’s usually a mess. If your garage isn’t neat, no buyer would surmise that you take good care of the whole house. You’re going to say I’m going to extremes but believe me, this works every time. Empty everything out of the garage. Hose down the floor, and if there are stains remaining, paint it porch gray. 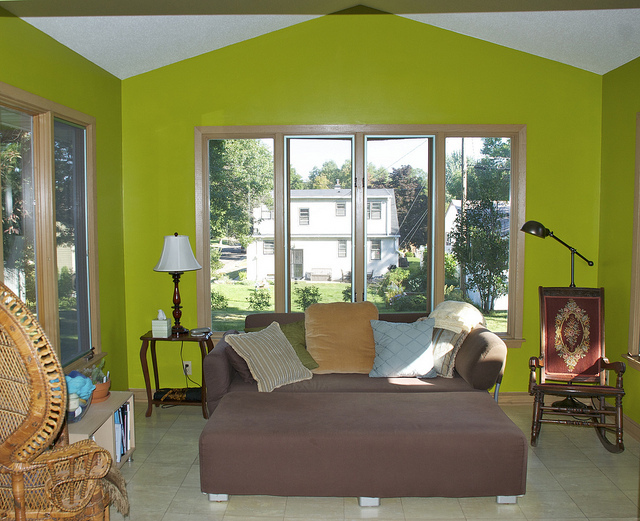 Paint the garage walls off-white using a flat latex paint. 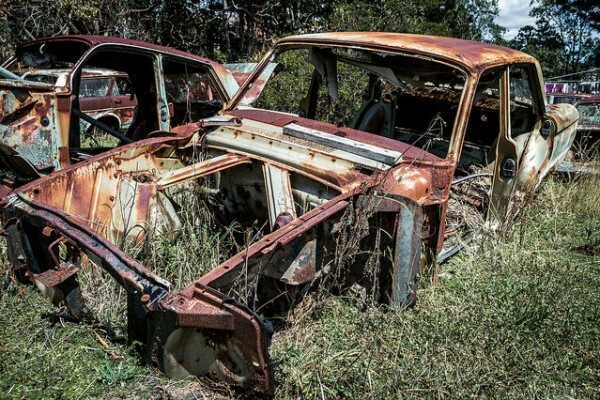 After the paint is dry – put everything back in the garage piece by piece and throw out what you won’t be taking with you. Then organize what’s left. If you have a storage shed, organize it the same way and if it needs a coat of paint or stain, do it. Use an open bag of charcoal to absorb moisture in the storage shed. If you have too much “stuff,” rent a storage unit and store it there. The less your garage looks like a scene from American Pickers, the better. Photo courtesy of @lisacee on Flickr. Want to know more about getting ready to sell your home? If you’d like to know more about preparing your house for sale or would like a free, no obligation room-by-room review of a home your thinking about selling please give Select Homes Team Real Estate a call at 316-686-9700 or continue your home buying/selling journey below.